Home » tech » gadgets » Can’t Load Gmail on your Kindle? 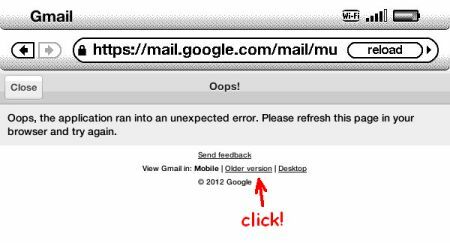 If you have an E-Ink version of the Kindle, such as the Kindle Touch or Kindle Keyboard (formerly known as the Kindle 3), and you occasionally use the built-in “experimental” browser to check your Gmail, you may want to see if you can still load the Gmail website. It seems that Google that has recently made some changes to the mobile version of it’s Gmail page which the Kindle’s browser doesn’t like. In your Kindle’s web browser, go to the URL m.gmail.com. If it fails to load and you end up with an error message like the one shown below, look for a link beneath the error message that reads “Older version” and click that. Gmail should load up fine with this older version, but if you’re still having problems, try reseting your Kindle from the main settings menu or by holding the power slider switch for 15 seconds.